It has been said that the best in-flight entertainment system is the window seat. I can never understand the person who selects the aisle seat when there is the option of observing the world passing by. Below is a selection of some aerial photographs of potentially interesting sea kayaking destinations seen out of the aircraft window over the last couple of years. Whenever I get in an aircraft it always stimulates ideas of where else to go paddling. The to do list, regarding kayaking destinations, continues to grow. Final approach in Barcelona. Didn’t manage to get any sea kayaking in although some of the coast looked pretty interesting from a paddling perspective. Particularly to the north, which is the venue for the Spanish Sea Kayak Symposium. Climbing out from Malta. Gozo on the left and Comino in the middle are clearly visible. There is some great kayaking to be had in the Maltese archipelago. Newhaven, Sussex. A few minutes after take off from Gatwick. It has been a few years since I paddled this stretch of the English coast. Superb meanders on the River Seine. Flying into clouds like these, over Dijon in France means that you are in for a bumpy ride. We were at 32,000 feet and some of the clouds were towering above us. Final approach into Malta, with views of the Grand Harbour. A great sunset and you know that the kayaking is likely to be superb in the morning. Poole Harbour in Dorset. Heading home after a weekend paddling in Swanage, which is just off the picture to the left. Always good to see where you have been. Approaching Jersey on a blustery September day. The Ecrehous below, a great paddle. Heading home from kayaking on the west coast of Greenland we had superb views of the east coast. Palo’s Wedding is a classic film by Knud Rasmussen, who was born in Iulissat, on the west coast of Greenland, on 7th June 1879, the son of a Danish missionary. He was the first European to dog sledge the whole length of the North West Passage, one of the numerous expeditions that he undertook between 1902 and 1933. 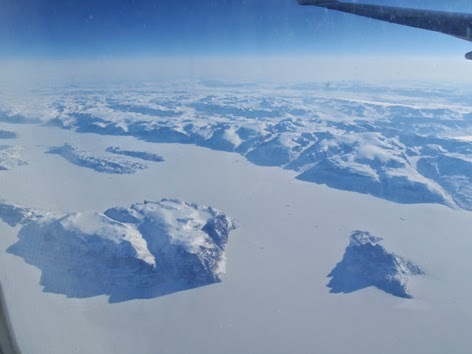 A number of geographical features are named after him, including the Knud Rasmussen Glacier in the far north west of Greenland and the Knud Rasmussen Range of mountains on the west coast of Greenland. In addition he was honoured by the Royal Geographical Society, the Royal Danish Geographical Society and the American Geographical Society as a consequence of his explorations in the Arctic. Whilst making the film Rasmussen developed food poisoning, supposedly from eating kiviaq, which developed into pneumonia and he sadly died on the 21st December 1933 at the age of 54. There are some short sections of the film available online but if possible it is well worth obtaining a full copy of the DVD. Palo’s Wedding makes for an interesting winters evening viewing for a kayak club. Two memorials to Knud Rasmussen. The o abovene in front of his place of birth and the one below looking north over the ice filled Disko Bay. The house in Ilulissat where Knud Rasmussen was born in 1879. His father was a Danish missionary living in the town. An umiak in front of the museum. Kamp Absalonsen, he was the vice-president of Qaannat Kattuffiat and chief Greenland kayaking competition judge, sitting in the earth house at the museum at Ilulissat. His love for all things Greenlandic is inspirational. The DVD “Palo’s Wedding” is a fitting memorial to one of the finest Arctic explorer’s of all time. It has been a while since I have posted some aerial photos taken from commercial flights so here are a few from the last few years. They show some potentially great kayaking destinations from above. With views like these it is hard to understand why anybody would book an aisle seat! Passing over Calshot when heading south towards Jersey. The site of the BCU Sea Touring Committee Symposiums in the early 1990’s. Greenland West Coast. The island on the right is Uummannaq and the larger Salliaruseq to the left. The cliffs and the larger islands are over 1,000 metres high. This post documents the day we paddled between the two islands. This was taken whilst flying from Heathrow to Seattle, some years ago. Take off from Jersey on a beautiful summers day. The aircraft is banking north over St Ouen’s Bay. Sunrise over the Thames estuary. 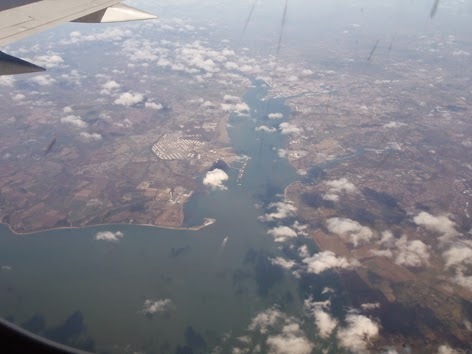 The south coast of Essex is clearly visible, just minutes after leaving Heathrow. A few hours later the Essex coast had been replaced by the Turkish coast to the west of Istanbul. Approaching Heathrow. The rectangular shaped water directly in front of the engine is the location of Tower Hamlets Canoe Club, an area we have visited regularly over the years as members of the Jersey Canoe Club paddling with kayakers from London. This is an updated version of an article I wrote in 2005 regarding the use of shoe polish to improve the look of my 1980’s vintage Nordkapp HM. Always one for the soft touch as I walked around the London Boat Show I was convinced, along with a couple of companions, that I really needed some leather balsam for protecting my shoes. I parted with my £10.00 and walked on my way. Some time later I stumbled across some fibre glass polish, now this was interesting as my 20 year old Nordkapp was starting to show its age. Whereas £10 seemed a huge amount for shoe polish I was far more willing to part with £40 to protect my beloved sea kayak. I returned home with two types of polish with the aim of writing a review of the one for fibre glass. I followed the instructions and sat back to review my handy work. With my hand on my heart I felt unable to write a review as I didn’t want you, dear reader, to make the same mistake as me and part with their hard earned cash. The fibre glass polish was really disappointing. Each week I used the leather balsam on my shoes never realizing that I held in my hand the key to restoring my kayak to some of its former glory. That is until Chris said, “Have you tried the shoe polish on your kayak?” Somewhat sceptically I applied the polish, it was quick and easy to do and the impact was amazing. Almost instantly scratches appeared to disappear and the colours were restored. A photograph taken in 2005, which clearly illustrates the difference an application of Renapur polish can make to the appearance of a kayak. Once the kayak was on the water the droplets glistened in the sunlight, it was just like paddling a new kayak. The great thing is that it only takes a matter of minutes to re-apply the polish, therefore it can be repeated on a regular basis ensuring that your precious kayak maintains its perfect looks. Paddling around Nordkapp in August 1986. At this point the kayak was just over 12 months old. There has been a lot of water under the hull since then. The Nordkapp on a beach in Greenland in 1993, still looking pretty good. The freshly polished front deck. Unfortunately it wasn’t sunny, if it had been the water droplets would be sparkling. This was taken today returning to Jersey from the Ecrehous. The product is “Renapur Leather Balsam”. Forget your shoes apply it to your kayak! Contact www.renapur.com for further details. After the winds of the day before it was a pleasure to wake to a calm morning. 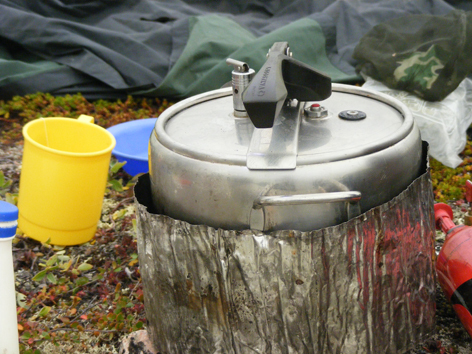 Breakfast was a very pleasant affair as we knew that we would be heading south, towards Pakitsoq, after the delays of the last 24 hours and could start to relax, with a good forecast for the next few days. We were quickly underway and our first stop for the day was Kugssuaq, where we knew that there was an easy landing and a good stream. After the winds of the day before it was a pleasure to paddle in such calm conditions. Always a pleasant place to stop for lunch, the beach at Kugssuaq. 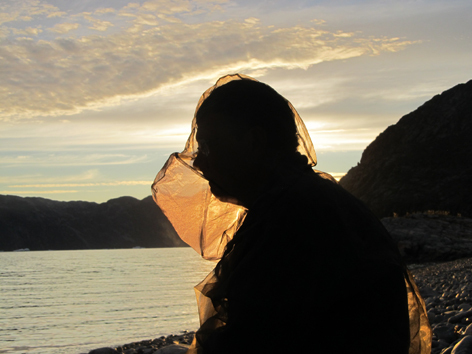 In addition to being an ideal lunch spot Kugssuaq is a great place to wash your hair. I have crossed Pakitsoq 13 times in the last few years and on every single occasion have seen whales. This year was no exception, although the views were rather distant. The first indication of whales in the vicinity is when you heard their breathing or saw the spray from their breath rising above the surface of the sea. Our focus though was ensuring that we managed to enter Pakitsoq safely, through the tidal narrows. I have always found that the safest way to enter Pakitsoq is to arrive at the narrows early, whilst he tide is still pouring out. Then either sit and wait or play in the tide race, until the outgoing flow has slackened enough to enable you to paddle through the narrows with a degree of control and in relative safety. We managed to enter, with a bit of uphill paddling at 17.30, this was on a day when high water at Ilulissat was at 21.05 and low water was at 14.18. The tide times are available here. Looking into the narrows which lead into the inner part of Pakitsoq. It was just a matter of waiting for the tide to rise and the outgoing stream to slow down. Once you are inside Pakitsoq a totally different world is revealed. The biggest difference is that there are no icebergs, so camping and moving the kayaks is much easier. There is no longer the need to have the kayaks 10 metres above the high water mark, just in case a large berg should roll over. Just as no bergs will make it through the gap because of the narrow water and the tides the same probably applies to large marine mammals so don’t expect to see whales swimming around in here. One thing to take into account is that the two daily tides are unequal in height. The evening tide is normally quite a bit bigger than the morning one, so take this into account when deciding how far to lift the kayaks up, the last line of wet seaweed is probably not far enough. On the day we entered the evening tide had a height of 2.6 metres, which seems to equate to a Spring, whilst the morning high water was only 1.8 metres. Once inside there are a number of options available but we chose to paddle the southern arm, which is much narrower and to explore some of the small islands scattered around the bay. Last time we had been in this area we camped at the head of the inlet, which allowed us to walk and see an amazing glacial landscape. This was the furthest we could paddle into Pakitsoq. The icecap wasn’t to far away. Wind blown deposits were gradually smothering the vegetation. This felt a very bleak spot. Some of the group felt the inner parts of Pakitsoq to be claustrophobic and felt happier as we headed back towards more open water. There is always a desire to climb to the top of the island and this was no exception. Great views alround. Note everybody is wearing Crocs the perfect footwear for kayaking in the Arctic. Paddling away from one of the islands inside Pakitsoq. The water is coloured by the small particles which have been carried into the bay by the glacial meltwater streams. Overall a very enjoyable day and made that much easier by the fact we didn’t to pack and unpack the kayaks. A day paddling an empty kayak is almost like having a rest day. The evening was spent relaxing around the campsite, admiring the view and rejoicing in the fact that there were no insects to bother us. The only negative feeling was a growing realization that in the next couple of days the trip would be over. 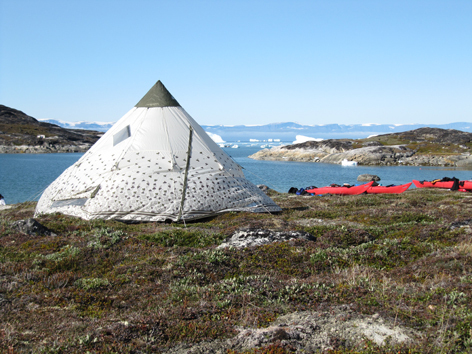 Greenland was once again casting its spell as a truly special sea kayaking destination. Just inside and on the southern shore of Pakitsup ilordlia is a perfect camping spot. Great views and no worrying about icebergs, because there aren’t any.